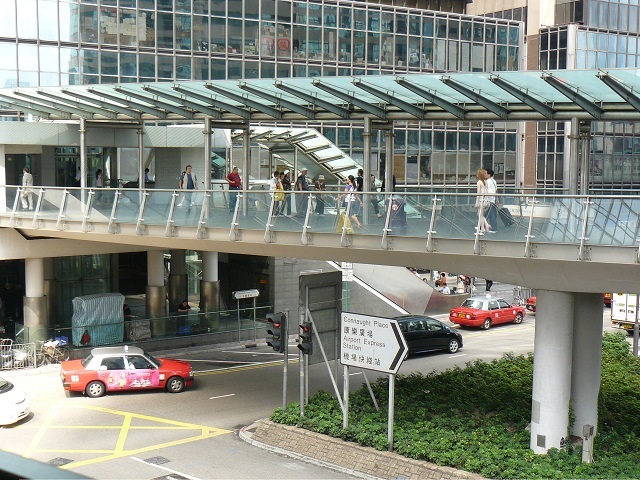 Skyways, like the one pictured here in Hong Kong, can be an integrated, accessible, and safe option for cities in need of more pedestrian-friendly infrastructure. Photo by See-ming Lee/Flickr. The rapid increase in car ownership in cities worldwide has brought conflicts between pedestrians and cars to center stage. Complete streets that accommodate all users not just are ideal in design, but have actually been successfully implemented in cities like Mexico City, New York City, and Copenhagen. However, when limited space or overcrowding effectively restrict the use of this kind of design, skyways are emerging as one solution for creating better walking environments. In some places, skyways also serve as important public spaces for various commercial and social activities. While they’ve only recently grown in visibility, skyways are not new. The earliest prototypes date back to 16th century Italy. Unlike pedestrian bridges—which usually connect two sides of a road—skyways usually lead pedestrians to certain important destinations, such as buildings, transit stations, and parks. Therefore, they tend to be longer, and in many cases are interconnected as a network. Modern skyways can range from 100 meters, such as those between two buildings, to several miles in length. Some of the largest skyway systems are the Plus 15 in Calgary, Canada and the Minneapolis Skyway System, both of which span several city blocks. But simply elevating pedestrians above roadways does not necessarily make for a livable, walkable city. These three examples show both the challenges and opportunities of skyways for people-oriented urban development. Mumbai’s skywalks have come under fire for their lack of accessibility, but they have the potential to serve as safe, vibrant public spaces for both social and commercial exchange. Photo by BMW Guggenheim Lab/Flickr. Mumbai, India’s most populous city, has busy streets and congested road traffic. Street vendors and parked vehicles further limit safe walking space at the street level. To improve safety and accessibility for pedestrians, the city has built 36 skyways connecting transit and commercial hotspots. If the full plan to build 50 skyways is completed, the system will be the largest in the world. Even though the skyways in Mumbai are designed for commuting purposes, they have attracted a variety of users. One survey shows that more than 1.5 million commuters make use of the skyways daily. In a city where open spaces are scarce, the skyways are also filling the role of public spaces for street vendors and playgrounds for kids. However, controversies arose when some residents complained about the structures blocking views from their buildings. And because they’re only accessible by stairs, the skyways do a poor job of serving seniors and people with disabilities. Furthermore, they are considered unsafe places for women traveling alone, especially at night. 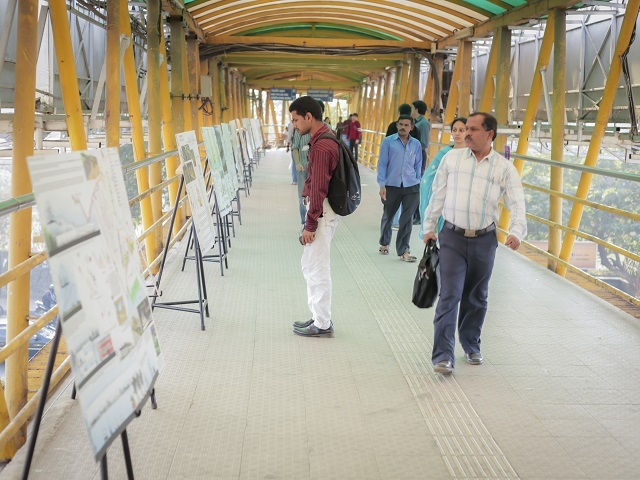 Despite these connectivity and accessibility problems, Mumbai’s skyway system does have the potential to enhance urban mobility if it is complemented with human-centered design and public participation. Thanks to a large number of escalators and elevators, Bangkok’s skyways give residents with disabilities greater access to their city. Photo by Beam Borwonputtikun/Flickr. Bangkok’s streets are also congested with cars and two-wheelers, and its sidewalks are occupied by motorcycles and street vendors. 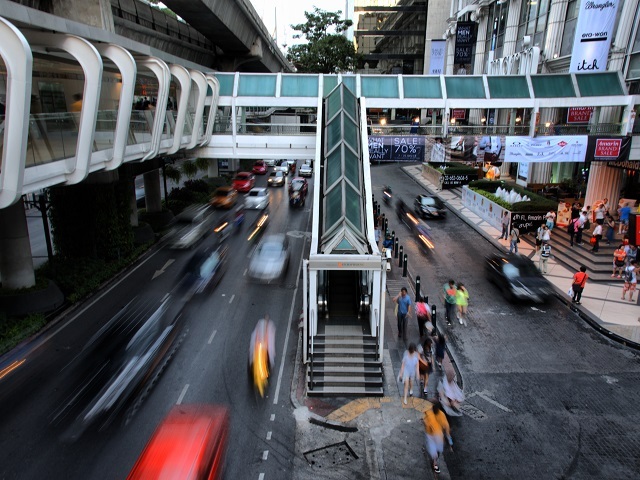 In downtown Bangkok, a one-kilometer skyway connects office buildings, shopping plazas, and hotels. With the help of clearly marked signs as well as escalators and elevators at metro stations and commercial buildings, the skyway provides pedestrians with safe access to jobs, entertainment, and other activities. This is also helpful to disabled people because Bangkok’s poorly-maintained sidewalks and numerous street vendors restrict mobility for those in a wheelchair. Hong Kong’s extensive network of skyways stimulates economic activity by connecting residents with popular commercial destinations. Photo by Swire/Flickr. Hong Kong, known for its impressive skylines and high density, has several skyway systems that connect almost every building in its business district. Due to limited usable land, hilly topography, and high population density, pedestrian accessibility to buildings has historically been problematic. As early as the 1970s, Hong Kong developers began linking important buildings with footbridges to improve accessibility. Since then, the construction of footbridges has expanded to an extensive downtown network of dozens of buildings. As directed by the city’s planning agency, developers of new buildings need to build additional footbridges to ensure continuous accessibility and add to the existing network. 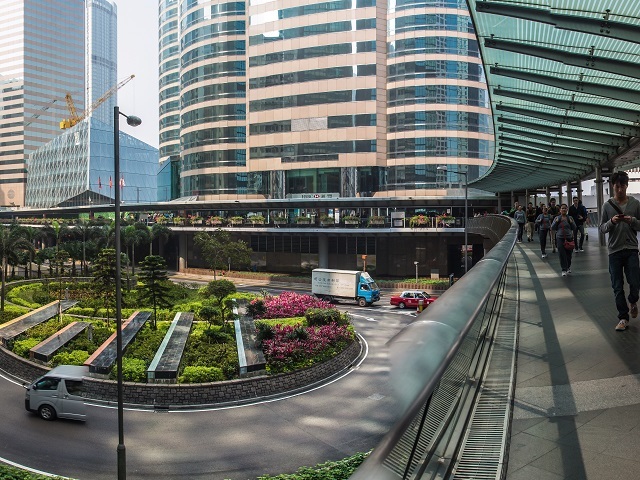 Hong Kong’s Central Elevated Walkway System connects almost every major business venue to hotels, public transport, open spaces, and other footbridge networks. The system has escalators, elevators, ramps, and staircases for easy access. The comfort and convenience of the skyway system has done more than just create a safer environment for pedestrians; it has also become a catalyst for tourism and economic activity. Skyways are not just segregated paths in the sky—they also can be powerful facilitators for vibrant street life. It’s important to understand that each city has its own unique socioeconomic, environmental, and historical context. The question of whether to use skyways and how to design them depends on local conditions and capacities. In most cases, accommodating the needs of pedestrians and cars at the street level is a more desirable solution for safe, people-friendly cities. However, if cities find themselves struggling to provide safety and accessibility to pedestrians, skyways offer a useful alternative.